Closed comb DE safety razor with a chrome finish. Earn up to 35 Reward Points for this item. 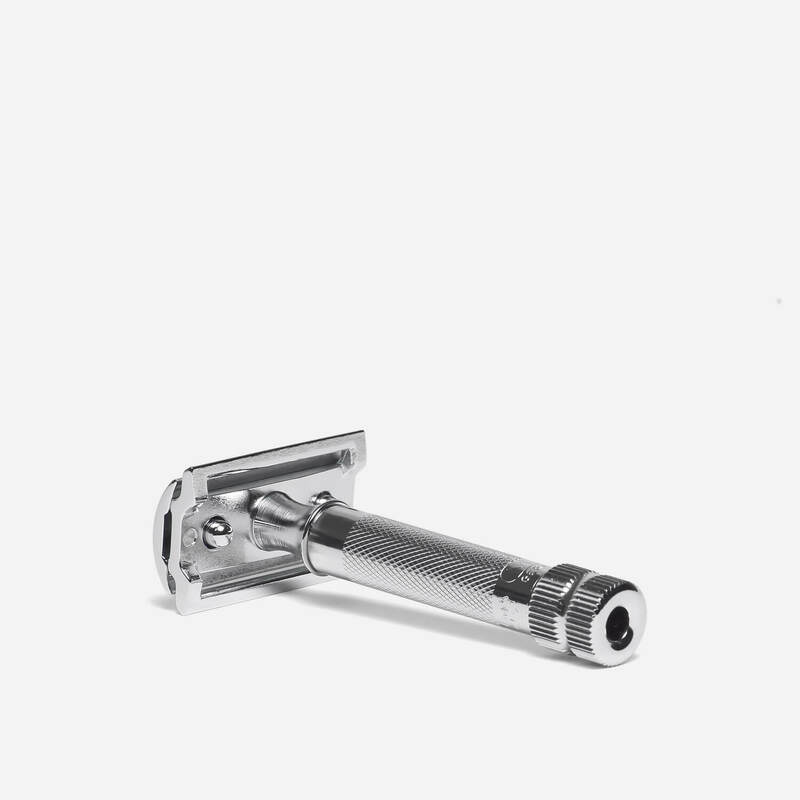 The Merkur 34C, also known as the 34C ‘HD’, is a closed comb DE safety razor that gives a close but mild shave, making it the ideal razor if you’re just starting out with DE safety razor shaving. The razor has a two-piece design, so only the top cap is detached from the handle in order to replace the razor blade. The 34C is made in Germany and features a high-quality chrome finish. As soon as I’d starting using this I could see why it has gathered such favour so quickly. It’s a lovely bit of kit – beautifully made and designed, a pleasure to hold and so well-balanced. It does the job properly, with the minimum of fuss too. A beautifully smooth shave, each time, every time. Beautiful things do, indeed, come in small packages. The Merkur 34C HD is the ultimate pocket rocket. Once you have your face appropriately lathered and a decent blade loaded in its heavyweight head, it’s immediately obvious why the Merkur 34c has won so much acclaim. It does its job superbly. It’s very nicely balanced and easy to hold, even for those with larger hands. I can’t rate this razor highly enough. But I have, anyway. Five stars. The same can be said of Shave Lounge’s customer service. There’s a reason it is so lauded. And rightly so. Also five stars. I don’t have anything to add to what others reviewers wrote about this instrument. Great one! As for Shave Lounge, first class customer service. Thank you. Shave Lounge delivered fast, within a couple of days (Used 1st class delivery). With the chrome 34c razors unavailble from all stockists, I decided to get the gold 34 Merkur version at a slightly higher cost. In hindsight I’m very happy. The razor looks and feels great! I have used this a few times and it feels solid and shaves v close, without burn. To put into context, I have used Double Edge razors for over 10 years and I think this is the best razor I have used so far – so this review really comes in line with the majority of the v positive reviews on this product. Overall – definitely a BUY, you wont be disappointed. Excellent razor and service; Shave Lounge was second to none thank you. As a beginner in the DE shaving world I researched forums as to the best razor to start with. The Merkur 34c seemed about the best bet. Obviously I am still developing my technique but even for the novice it is very easy to use, well made and weighted just right. I am sure I will be using it for many years. Just started DE shaving, and this baby does the business. Felt a little short at first, but that’s just from being used to my old cartridge razor. Now I love it. An excellent first step. I have been using my brand new Merkur 34c HD razor, I have to confess that I am very impressed with it, gives a very close and good shave the only bad thing that I have found is the handle is a bit on the short side, would I buy one again yes you bet, a happy customer. Same head as my favourite 38C but shorter and grippier handle, basically. Works very well, and using my favourite Wilkinson blades it’s very effective yet forgiving. Not so with the Feathers. However! I can use Feather blades in my Futur if I dial it down to “2” on the scale, but when I tried them in this I managed to cut off a piece of my ear. (Well, only a tiny little bit, but it bled like a b***ard!!) The blade was so sharp that I didn’t even notice that I’d cut myself – I just wondered where all the blood had come from! Would I recommend this to a beginner in light of this? Yes. The 34C is a design classic and a great razor. Just make sure you use a more gentle blade and if necessary, re-lather and make a 2nd or 3rd pass. I would only recommend using a 34C with Feather blades if you really know your stuff – and you concentrate! Great service from Shave Lounge as usual. Thanks Guys! I have owned one of these excellent razors for just over one year now. I found that if gave me the best ever shave I’ve had, but the screws that screws in to the handle broke and now it’s useless. I had expected it to last for at least 5 to 10 years very disappointed. A great razor for a every day shave. Comfortable and easy to use, makes shaving a real pleasure. Nice and heavy, feels well built to me. Easy to change blades and clean. No complaints at all. Agree with many of the other reviewers that this is a very good razor indeed. Much more forgiving than my Merkur Futur and certainly a recommendation for those new to double edged razors. It has a easier learning curve and is much less likely to nick the inexperienced shaver. The reassuring weight adds to the feel of a quality product and makes it all the more easier to use. The short handle is a matter of personal taste but I feel it is more controllable this way and it also makes it a very good travel razor. You want to enter the DE shaving world? This is your tool! This is my first ever DE razor, and all the reviews do it justice, it is very forgiving, haven’t got a single cut or razor burn since using it and I have super sensitive acne prone skin. I have nothing but praise for this especially after years of problems with cartridges ranging from single to five blades!!! DE is the best especially if you get the technique and prep just right! Solid, heavy, seriously well built — this is a superb safety razor. Gives me a close shave every time and is well worth investing in. This razor, in my opinion, is the greatest shaving investment you can make. For less than £30, it’s superbly built, easy to use, and gives an unbelievably close shave. Ditch your Gillette now, and invest in one of these bad boys! Had this razor for a few weeks now and I love it. I was originally sceptical about using a safety razor, after using a multi-blade for so long, but it’s actually a breeze to use and I get the closest shave of my life. Use with a good quality cream and you can’t go wrong – no cuts, no irritation, just a super smooth shave! Buy one, you won’t be disappointed! I bought the Merkur HD Razor after using the Merkur Futur for the last year. In comparison, the HD feels a little less weighty than the Futur, but I find it a lot more nimble with awkward areas of the face, such as between the nose and top lip, a lot easier to shave. Although I highly rate the Merkur Futur, I would definitely recommend the Merkur HD as an excellent alternative, especially for safety razor beginners, as it’s a lot more forgiving that the Futur but still gives a first class shave. It’s also great for travel use as it’s smaller and lighter than the Merkur Futur.